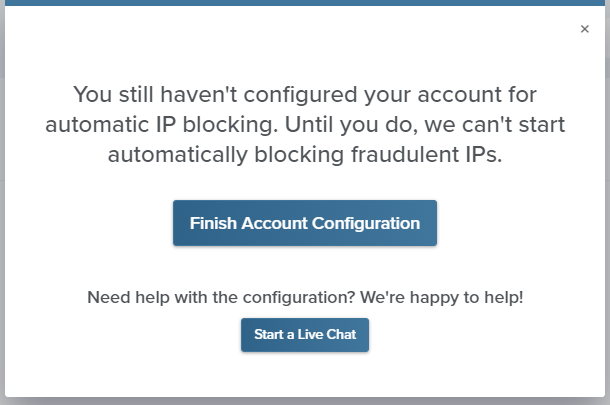 How do I activate automatic IP blocking for my account? Automatic IP blocking is a feature only relevant to your Adwords account. In order to allow ClickCease to block click fraud automatically and instantly you have to grant us access to your Adwords account. On first login, you will be prompt to complete your account configuration. Click the finish account configuration button. Input your adwords account id and click "submit adwords id", The system will automatically send you an access request to your Adwords account from our ClickCease MCC account. Once accepted, the account will have its automatic IP blocking feature turned on within 15 minutes. Once the configuration process completes, you will be notified by email. Until the configuration process completes it is time to install the ClickCease monitoring system.